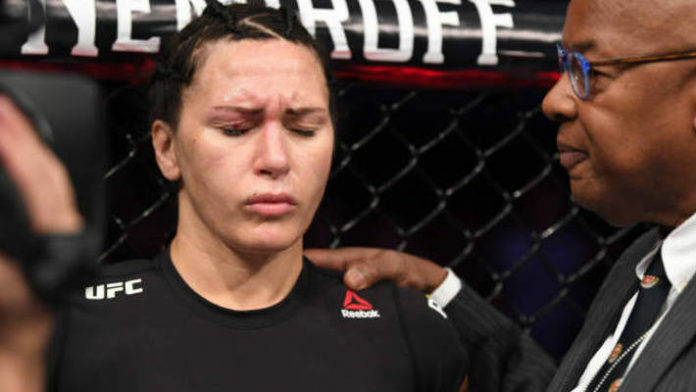 Cat Zingano has walked out of UFC 232 without a serious injury. Zingano did battle with Megan Anderson on the FOX Sports 1 portion of the UFC 232 prelims. The bout didn’t last long and saw a bizarre finish. Anderson threw a head kick and her big toe caught the eye of Zingano. The fight was stopped when Zingano stopped defending herself properly. “Alpha” never opened her eyes back up inside the Octagon as far as the cameras showed and a cut formed on her eyelid. Cat Zingano suffered an eyelid laceration, according to the UFC. It was repaired on site and she was not transported to the hospital. Anderson said she’s open to giving Zingano a rematch. She said if the rematch doesn’t happen, then she’d like to face the winner of Cris Cyborg vs. Amanda Nunes. A title fight for Anderson is unlikely as she’s 1-1 inside the Octagon and dropped her promotional debut against Holly Holm, who would be the more likely contender. MMA News has been providing live coverage of UFC 232. We’ve got live results and highlights. We’ll also be bringing you post-fight tidbits following the event such as quotes from the post-fight press conference. Do you think the UFC should book a rematch between Cat Zingano and Megan Anderson?